For those you don’t understand what an annutiy is, here is definiation from investopedia.com: “An annuity is a contractual financial product sold by financial institutions that is designed to accept and grow funds from an individual and then, upon annuitization, pay out a stream of payments to the individual at a later point in time. The period of time when an annuity is being funded and before payouts begin is referred to as the accumulation phase. Once payments commence, the contract is in the annuitization phase.” You open an annuity account with a financial institution. Open the account with x amount of money, maybe with a few payments, and them leave the account alone. You’ll have to let the funds grow, accumulate. After x amount of years, depending on the contract, you’ll be receiving payouts from your annuity account. It’s like a forgotten saving account. Except this forgotten savings account is for the future, like college tuition money for your kids or to keep financially stable during retirement. Here is scenario that builds ups to the “what if” situation. You purchase an annuity 45 years ago, and today it’s worth $200,000. These annuity is your major assets, plus you have a lot of bills and a couple for assets here and there. Now, you barely afford to pay your bills, and so there is a chance that you’ll be filing bankruptcy. Enhance, will filing bankruptcy mean losing the annuity? **Arizona Title 44, chapter 8, article 1, relates to transfers made while broke or intentionally to defeat creditors. These requirements are not harsh, they are very reasonable. If points one to three are met, there there is chance you’ll keep the annuity. However, if your attentions were as stated in Arizona Title 44, chapter 8, article 1, then there will be complications. My AZ Lawyers recommended you to the properly plan your finances with the appropriate legal advice. The lawyers at My AZ Lawyers are here to help with the legal advice. We know that life is messy, and bankruptcy could be part of that mess. Understanding and being aware of the bankruptcy laws in Arizona is quite the challenge. 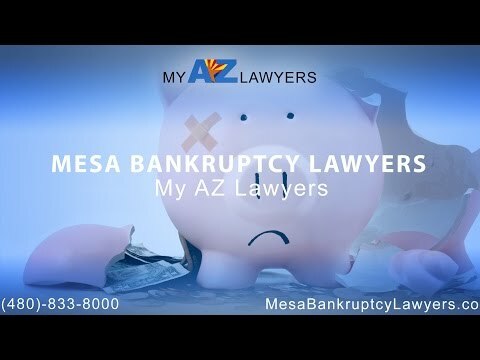 Consult with a bankruptcy lawyer in Mesa at My AZ Lawyers to understand the regulations of bankruptcy laws.